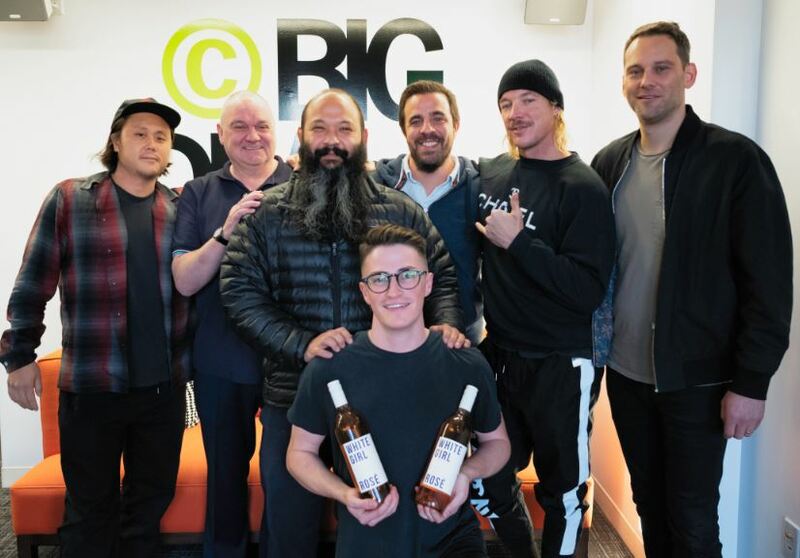 On the occasion of inking a JV deal with Diplo’s Mad Decent Publishing, Kenny MacPherson and team Big Deal gather for an ebullient photo op and rosé-fueled rave. Kenny then explained that “Diplo” also happens to be the name of a popular Scottish pudding consisting of buckwheat, molasses and… never mind, it’s too disgusting. Seen quibbling over who’d get to be the featured vocalist are (l-r) Mad Decent A&R exec Juba Lee, MacPherson, Diplo manager/partner Kevin Kusatsu, Big Deal Music Group Co-Founder/EVP Jamie Cerreta, Diplo, BDMG Partner Casey Robison and (kneeling) Mad Decent A&R dude Nate Olivas. Mad Decent was launched by Wesley "Diplo" Pentz in 2006 as an EDM label and has in the interim emerged as a major electronic-music brand with 1m+ YouTube subscribers. Diplo's own recent projects include the L.S.D. (with Sia and Labrinth) and Silk City (both on Columbia); Mad Decent writers Picard Brothers contributed to the recent Mark Ronson-Miley Cyrus banger "Nothing Breaks Like a Heart" (RCA). “Partnering with Big Deal gives us the best environment to be effective publishers and A&R people," declared Kusatsu. "We’re always looking for partners who have a history of taking chances artistically and making them count and Mad Decent is known for just that," noted Cerreta. "Kevin and I have been great friends for years, and it’s been fun to watch him and Wes build this great business and creative platform for innovative talent. It just seems very natural and super exciting to finally get to work together and build something special."